Mummy Hearts Money: Chrisco Hampers: How does the value stack up? Like thousands of other Australians, at this time of year I have always had a whooping big Chrisco Hamper delivery, boxes and boxes filled with groceries and goodies that we love. I love the excess of $1,000 turning up all at once. I love that the hampers are always filled with brands and goodies that I might not buy often throughout the year, but that are luxuries for our home. I love freeing up my usual grocery money to spend on Christmas foods and presents since my cupboards are usually straining with food by now. But last year, the meat that arrived really wasn't that good (sorry Chrisco) and to my irritation I found myself casseroling all of the meat on the steaks because they were too tough to eat. It occurred to me that maybe this year instead of buying Chrisco meat hampers, I would instead put the meat money aside in a separate bank account and take the plunge at buying a whole carcass from an independent butcher, and see if there was better quality and value to be had that way. And since I was going to cancel that much of my order, maybe it was also worth cancelling the grocery hampers and seeing if I could pull some better value by buying the products myself. Since I cancelled my order late last year, I have been transferring my $20 every week to an ING account kept sacred for the purpose, and now I find myself with $1,000+ to spend on groceries. The meat order is placed (and I will write a separate post about how that went). This week, I set off with the 2012 catalogue for Chrisco to my local grocery shops to see how I would go replicating one of my favourite hampers. 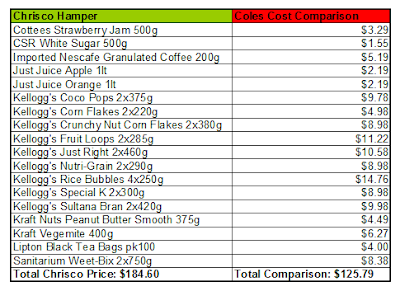 I completed a clean cost comparison between what Chrisco says the Breakfast Hamper is worth, and what the shelf price at Coles says the hamper should be worth. I didn't take into account all the specials that Coles had on many of the products. And I was shocked at the difference. I was expecting to see that Chrisco does not pass along their bulk buy costs in the hamper absolutely. Maybe even a small markup. But the outcome is a whopping 31% difference. The Chrisco 2012 Christmas Hamper Catalogue tells us the hamper is worth $184.60, whereas standard retail shelf prices at a mainstream grocery store tells us the hamper is worth only $125.79. **Imported Nescafe Coffee sourced from www.officeworks.com.au & Kelloggs Fruit Loops sourced from www.woolworths.com.au. These specific products/quantities were not available at Coles. I cannot believe I have been paying such a massive premium on my hampers all these years. I cannot believe how much of my money I have been throwing away. Hundreds of dollars every year, without a clue. Today I wandered across to both Woolies and Coles to actually buy my own version of the hamper. Taking advantage of their catalogue specials I bought bigger quantities of all our favourite cereals, spreads, juices, and used the difference to buy extra items to bulk out the cupboard even more. My cupboard is overflowing with pancake shakes, cereal, syrups, spreads of all kinds, crumpets, raison toast, baked beans, spaghetti's, you name it, its in there. And I spent less, but got so many more products. All of the cereals were bought in the much larger sizes, but the unit price of each item was less than the standard RRP for the smaller quantities. I wanted to pay special attention to this particular hamper, so I haven't even begun to buy some of the other products we would normally have gotten in a hamper, but I'll be back to the stores to buy more soon. Am going to do an Aldi run as well for frozen goods, because the stuff is such great value and we love the taste so there will be even more value to be had there when I do. If like me you love the excess of food at Christmas, I cannot encourage you enough to make the change in 2013 to self service your own hampers. Set up a dedicated bank account have the money transferred there routinely, and buy the food yourself. Don't keep paying a massive premium for someone else to do the work for you. Are you a hamper buyer? Will you keep buying now, or make a change? Wow I knew it was pricey. My friend bought 1000's of dollars of Crisco Hampers - she couldn't have saved it in another account she wouldn't have had the self control(her hubby may have wanted the money instead as well). Her kids ate that breakfast one in 1 wk though. I think the self control was always my hardest challenge as well, but making it a separate online account helped me. I'm so tickled with how much spare cash I have now after I've bought all this food! yeah... good for you.. It was a similar experience for me too. It was good for the first year... it stopped filling my needs... but it felt good to have it come to my door. It made it look like there was food there. It wasn't the right kinds of food. I'm going to grow my own this coming yr... in our small apt setting etc.... my kids aren't kids anymore and work harder their jobs and can't burn it off as easy as it was then, and they look for something more nutritious and those hampers just don't offer that. Any more tips you have in the do it yourself mode? Yep, I compared once. My step mum used to always get them and our family view was they were a waste. So I sat down and compared and showed her (because that is a great way to form a friendship with your new stepmum, show her what she is doing wrong! lol). She was shocked. She had never looked at it this way and so she started doing her own "Chrisco" through the year and saved so much money. I stopped buying chrisco several years ago as I figured this out all myself, along with the stuff that I wouldn't normally buy as no one in my house eats and then all the superfluous stuff like paper plates and cups etc... that we don't actually use but if I wanted them id buy homebrand or go to a discount store like the Reject shop. the Meat started getting poorer and poorer quality over the years. I remember the first year approx. 12 years ago that I got chrisco and I was in love with the meat and really disappointed when it ran out as I couldn't find the same meats in coles or woollies. the kids loved the sausages that I couldn't find anywhere !! That was my reasoning for paying way more for chrisco than if id saved and did a thousand dollar shop myself, and understanding that chrisco need to pay there employees also and there would be a lot of staff involved. But the meat got worse every year and I had two years in a row that stuff was missing. Last Christmas my friend was missing a box (pantry filler) and she had to actually go make a statement to the police and report it stolen and call chrisco back and give them a receipt number from the police statement before they would do ANYTHING about it. It wasted her time and the polices as they actually cant do anything about it unless it was deliberately stolen and you can prove it. I paid something like $330 for a simpsons film cell picture for a xmas gift and was very irate indeed when I walked into our local Whats New store and seen it for $78 !!!!!! Wow, $330 down to $78, thats a HUGE difference! I am so disappointed in their pricing, as they would be getting all their goods at wholesale costing. At the very least I would expect them to be on a par with the major retailers, but certainly not 30% higher. Im taking your suggestion for next year for sure! :) I don't do it every year but did this year. But makes sense just to have that amount put into another acct each week & spend as I like at the end of the year! I always thought the whole grocery hamper thingy was for people of a certain demographic to enocourage them to save - I mean is it really that great to get a glut of groceries at Christmas? Nice work pointing out the massive 31% price hike for the privilege of paying in advance. Thanks for making this comparison for us. I always wondered and hubby has been dead against the hampers. I guess if you dont have the self control to save the money then its worth it but otherwise having the money direct debited is the only way some people can do it. I suppose its up to your individual circumstances. Do not get a hamper!!!!!! Total rip off!!!!! Have been a Chrisco customer for 10 years. Would never go back!! Buy shop vouchers every week and use them to get your groceries - much better value!!! There will always be people who cash in on the inability of others. This system is not about affordability but convenience, and that is what you pay for, even though I did not realise their markup was so high. This company has a bad reputation for their meat products. I know there is a premium to be paid for the self control factor of putting money away each week - but 31%? I know where I'd rather put my money - great work exposing this one Mummyhearts money! I've always known there is a high markup, however, living rural, many products arent available to me normally. The convenience of delivery and having everything before the mad christmas rush also makes it worth it for me.. Yes there is a markup on price, but how many thousands of people would be out of a job if chrisco starts failing as a business? hi , this is good ! good is always better. Live & Learn. its nice to feel pampered and spoiled but yeah me too. The amounts were getting less..my first yr 8 - 10 yrs back was awesome! It pulled us through especially the meat hampers. They were good! the quantity over the last years did decrease. What else is there...Price Smart grocery store BC ! is good for some and Walmart is also good for some. The one I love the most is!!! drum roooolllll pls! No Frills!!!! my son says "its a a single mans grocery store! " yeah he'd be right.